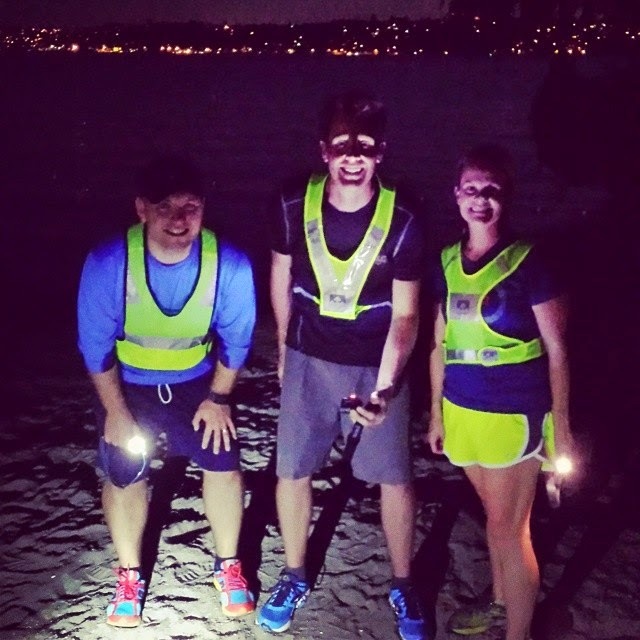 On Wednesday night I met up with three of my Ragnar teammates to practice running in the dark. And not just in the dark, but decked out in the safety gear required by Ragnar. Even though it made a car full of kids who were clearly very cool yell "losers!" at us as we ran past, I am very glad we had all of the gear on. It is dark in the, well, dark. We passed other people who were out for a stroll and you couldn't even see them, so yeah, safety is good. Even if it makes you look like a loser. We met up in Bellevue at dusk and ran west towards the lake. It was pitch black once we made it to a beach on the shore of Lake Washington. A perfect place to stop and take some pictures to commemorate the occasion! After our stop we headed back to the cars. We ran two miles slightly downhill to the lake, so it was two miles slightly uphill to get back. Oof. One thing that worked really well for me was to use the clip on light that I had on my hat as well as hold a headlamp in my hand. One of my teammates gave me that tip and it was perfect. The light on your head illuminates the general area in front of you and makes you visible, the light in your hand can be pointed easily at anything you want to check out, like curbs or obstacles or anything else. Hopefully the team will get together to run again after Ragnar! We had such a fun time. I've never gone running at night but it sounds fun if you have a group to go with. I can barely get anyone to run with me in daylight! lol. Have fun at Ragner this weekend.